Today’s “Freebie on the Fifth” coordinates with my mood board this week. I absolutely loved working with this color combo…I hope you enjoy creating something with it! As usual you can get part of the freebie here on my blog. Usually Kristina Proffitt contributes, but she’s a little (okay…a LOT) busy right now because they are in the middle of moving…so I contributed six cards this month. You can get the other three from Rebecca Cooper of Simple As That. 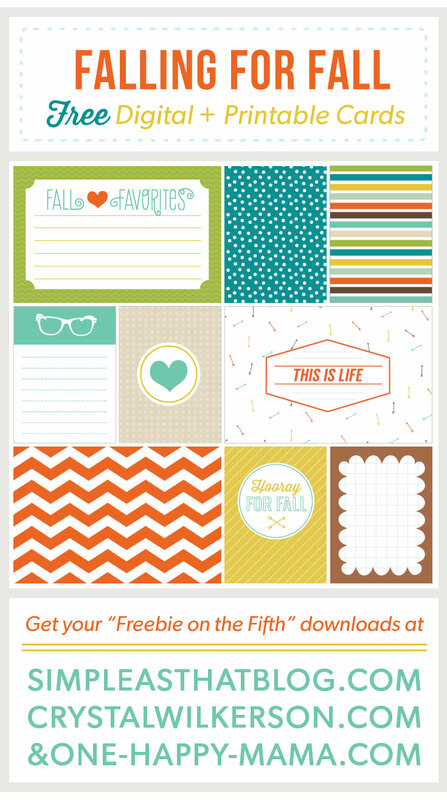 Also, in case you missed our other FREEBIE ON THE FIFTH cards, you can find all of our free downloads when you go HERE. If you want to see us continue these freebies in 2015, please take the time to share via Pinterest & your other social connections! We appreciate your help in spreading the word! Thank you, Crystal! And good luck to Kristina with the moving! Thank you so much! These are fabulous! Hi! The link for these doesn’t work, but they’re super cute. Any chance I can still get them?